Welcome! Today I’m hosting a spot on the Great Escapes Virtual Book Tour for Shattered at Sea by Cheryl Hollon. It was an interesting read. I’ll be sharing an author interview underneath the review. ** I apologize as this took me longer to get up than I thought it would! When Savannah signs on to perform glass blowing on a ship, part of the appeal is that she’ll get a chance to reconnect with her boyfriend Edward’s family. An added bonus is that Edward’s cousin, Ian, will be joining them on board. But when Ian disappears at the beginning of the cruise, the ship’s authorities initially consider it suicide. This was not my favorite book in the series. I had a hard time getting into it and it didn’t keep my attention very well, which is unusual, because I really enjoy this series. In fact, the book before this one, I think was my favorite out of the series so far. We’re still spending time with our favorite characters, Savannah and Edward. We even get to see some of our favorite secondary characters like the Rosenberg sisters. Amanda and Jacob are a still a part of the story, just more on the peripheral edge. The setting is a cruise ship and maybe that was part of my problem, I don’t know. Every other book I’ve read set on a cruise ship, I haven’t really enjoyed either. So maybe that was my problem with it. The plot line was decent. I knew who the villain was before it was announced, but there were still red herrings. I did thoroughly enjoy the ending tho! I still recommend it if you enjoy this series, it’s just not my favorite of the bunch. Ms. Hollon’s Answer: I’m so lucky to be able to write as a full-time job. I took early retirement from an engineering career designing and installing military flight simulators in England, Wales, Australia, Singapore, Taiwan, and India. Ms. Hollon’s Answer: I write every morning from about 7-10 am. That’s when the words slip out easiest. I have a word target every day that I try to exceed. I need absolute silence for brand new words in a rough draft, but I can revise in the middle of a pub. Ms. Hollon’s Answer: I’ve recently discovered that I am a visual writer in that I play the scene in my head like watching a film. I am a hybrid outliner/pantser. My first story treatment is usually a 12 to 14-page word document. Then I flesh that out in a detailed outline in Excel with columns for Location, Time of Day, Point of View, etc. When I start writing the first draft, I’m open to improvements and opportunities to strengthen the plot and deepen the characters. I update my spreadsheet up until the last five chapters. At that point, there’s a rush to the finish line – no looking back. Ms. Hollon’s Answer: I started looking for an agent with my third completed manuscript. I got very close, but ultimately, I collected 108 rejections before I moved on to the next book. I seriously thought of quitting at that point, but I’m absolutely addicted to writing. I submitted it to my future agency after I received an e-mail from a member of Sisters in Crime. (Great organization for help in getting and staying published.) The agency wanted cozy mysteries, but I sent in my International Flight Simulator Mystery. The agent loved the writing, but she didn’t think she could sell it in the current market. So, I told her I had an idea for a cozy mystery featuring a stained-glass shop, would she be interested. She returned an e-mail with a single word: “Sure.” I worked up three chapters, a synopsis and story ideas for more books in the series. Everything happened quickly after that – agent – submissions to publishers – 3-book deal with Kensington. Ms. Hollon’s Answer: I revise the draft book a minimum of four times then send it off to an independent editor for a developmental edit, then I revise again and send it to my Agent. I revise again and send it to my Kensington editor. She has comments and so I revise yet again for at least one round. Next is the copy editor round and finally the galley proofs get a review. That’s a minimum of nine formal revisions for each book. I would like more, but luckily the deadline arrives, and I must press the send button. Q6: A good villain is hard to write. How did you get in touch with your inner villain(s) to write this book? Was there a real-life inspiration for him/her/it? Ms. Hollon’s Answer: I try to develop the villain as carefully as any of my recurring characters. I don’t model them after read people exactly. I tend to take a Frankenstein mash-up of several character types and go on from there. The trick is to develop each suspect to the same level so that the red herrings stay red herrings. Ms. Hollon’s Answer: I would like to create a series set in the English Village where I lived when I worked for British Aerospace. However, I would be interested in the WWII time frame as an American woman engineer. Sounds fun, doesn’t it? Ms. Hollon’s Answer: Glass Houses by Louise Penny, 19 Souls by J.D. Allen, The Girl from Blind River by Gale Massey, Scot Free by Catriona McPherson, and I’m about to start Twenty-one Days by Anne Perry. I read a lot. Ms. Hollon’s Answer: The Lord Peter Whimsey series by Dorothy L. Sayers and the Amelia Peabody books by Elizabeth Peters. Ms. Hollon’s Answer: I identify strongly with the Harriet Vane character in the Peter Whimsey mysteries. I would invite her to a five-course dinner at the Chef’s table in the kitchen of Queen’s Head Pub here in St. Petersburg, FL. I would invite my local writer friends so we could talk mystery craft until we were stuffed in brain and body. Ms. Hollon’s Answer: Although general advice is to ignore them, I read them for guidance on what parts of the craft of writing I can study and improve. I don’t take them too personally – everyone has books that they love that no one else likes and books that they can’t stand even though everyone else loves it. Thanks for joining me today! If you wish to visit other stops on the tour, please click on the banner below! 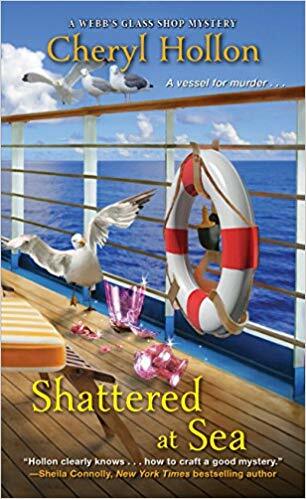 Thank you for your review on “Shattered at Sea” by Cheryl Hollon and for being part of the book tour. Enjoyed reading the interview. Always fun to learn more about book and author. Can’t wait for the opportunity to read this book.